The Islamist purge of the Egyptian military has begun. Read more. 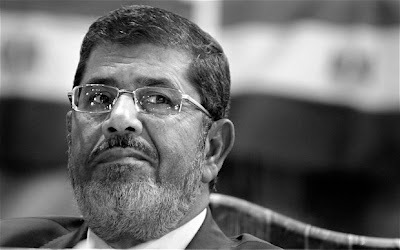 If the Islamists win this round it will be the first big, post-election step on the long march toward remaking the Egyptian military in the Muslim Brotherhood's image. Following the Turkish model (which the Obama administration has hailed), the MB plans to purge generals, arrest and accuse officers of plotting coups, install political commissars and spies, etc. until the group's goal is achieved--an Islamized military. Egypt's intelligence services are slated for cleansing and remaking, as well; and, assuming it can hold onto power, the MB may also copy a page from Islamist Iran's Hitlerian playbook and create an elite, SS/IRGC-like force--and a parallel paramilitary organization--above the regular army. Egypt is on the way to becoming to another Iran, owing in large measure to the Obama administration's odious policy of engaging (appeasing and collaborating with) radical (rightwing political) Islam, apart, of course, from Al Qaeda and its affiliates. Cairo is the new Tehran--and Obama is the new Carter.